Vanguard is pleased to announce its 4th annual C4ISR and Beyond event, which will take place at the Fairmont Château Laurier in Ottawa on January 30, 2018. This event will continue to focus on bringing stakeholders from industry, military, and government together, for robust discussions around lessons learned and to share in the latest technological advancements and its impact within the industry. This unique event continues to provide a conversation platform between key suppliers and DND within a panel discussion environment. Hear valuable information that is critical to DND on a variety of technologies and highlight capabilities that can fit future needs. Currently, details of the speaking agenda are being finalized, which will be released shortly. To attend this event, please register early to take advantage of the early bird rate and limited seating. Don’t miss this one-day event that will be jam-packed with information and high-quality speakers. It’s an opportunity to learn and engage in peer-to-peer interaction. 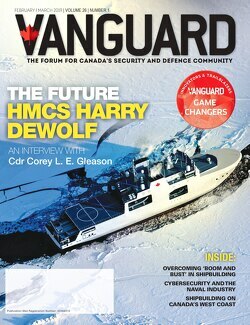 To register go to https://vanguardcanada.com//c4isr2018. This year’s C4ISR & Beyond event is shaping up to be one of our best ever and we welcome your feedback and comments. Please direct same to Terri Pavelic, Editor-in-Chief at Terri@promotivemedia.ca.